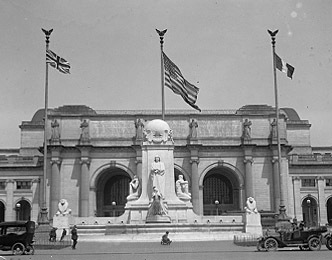 The story of Union Station is included in our Capitol Hill Tour. Listen to a preview here and download the stop by itself or as part of the full tour! All roads may lead to Rome but all railroads lead to Union Station in Washington DC. Over 32 million people pass through here every year, be it by train, subway, car, bus, or foot. Completed in 1908, Union Station's magnificent architectural accomplishment stands on par with the United States Capitol Building. The famous Columbus Fountain stands in front of the main entrance. It is truly one of those spots where photographs cannot do full justice. Today, along with being a hub of rail travel, Union Station contains over 100 specialty shops and restaurants. Learn more on our Capitol Hill Tour.